This talk will explore the history of the PennSound archive, the world’s largest online archive of recordings of poets reading their own work. With recordings reaching back to Apollinaire’s 1913 performance at the Sorbonne through recently recorded audio of contemporary poets, PennSound is dedicated to being free and open to all. In addition to a look at the archive itself, including historical recordings of poets like Robert Frost and Gertrude Stein, we will detail ways in which PennSound is being used for cutting-edge digital research into the performed poem. 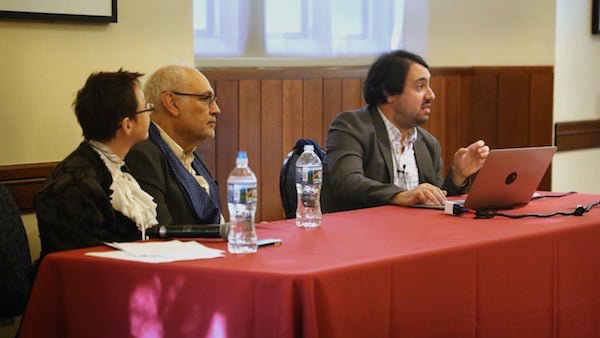 Penn Arts and Sciences' Knowledge by the Slice lunchtime series offers educational talks led by insightful faculty experts. Did we mention there's pizza? So sit back, relax—and have a slice on us. Can’t make it to the lecture? Watch a live stream of Knowledge by the Slice on Facebook or Twitter @PennSAS. For more information, go to www.sas.upenn.edu and click on the Knowledge by the Slice icon.